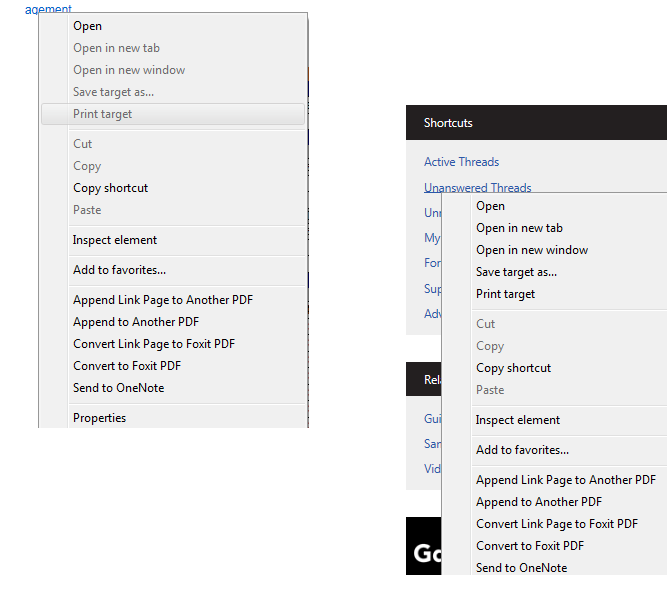 The context menu options "Open in new tab" and "Open in new window" is disabled when I right click on a hyperlink. What causes context menu options to disable? How do I enable them? According to your description, I tested it in myside, but I can not meet your issue in my side. So I think this issue is related to the browser setting. So I suggest you could modify your browser setting or try it in the other browser. It can't be my browser because I can see option in other apps including this forum. I have not used any code, properties or options to disable these context menu options. After read your result, I have tested in my side in IE and Chrome. The same linkbutton is enable open in new tab in Chrome, but it has been disabled in the IE. I checked the element of linkbutton and tag "a" in IE, you could remove value in href to make it work. I think this behavior is belongs to browser. I think you could use JS to rewrite the href attribute value.